Listening to the sound tract of Oklahoma would give a tip about the conflict between the cowmen and the farmers. I think the point about the cattlemen and the farmers is a great one to show the conflict that often exists in a society. However, we must not overlook the point made by John T. Willis that the term livestock includes cattle, sheep, goats, etc. Note the comment. John T. Willis points out that the term livestock (or cattle; Hebrew, miqneh) is “a comprehensive term including cattle, sheep, goats, and the like” (Genesis in The Living Word Commentary on the Old Testament). 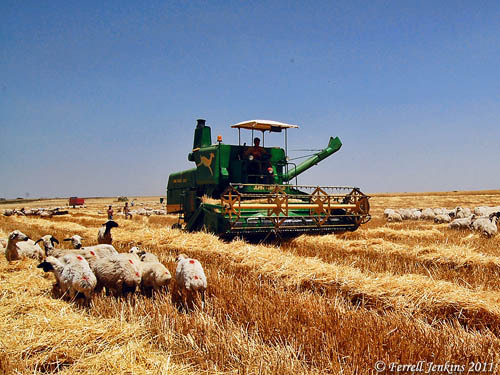 It is common in the Middle East for shepherds to take sheep into a grain field as soon as the harvesting is complete. This could be a real problem if cattle of any kind got into the fields in advance of harvesting. Remember that fences are virtually unknown there. This photo is one I made in eastern Turkey north of Sanliurfa (and Haran). Even before the combine gets out of the field the shepherds are there with their sheep. Sheep grazing in Eastern Turkey as a field is being harvested. Photo by Ferrell Jenkins. Recently we posted a photo of sheep grazing in a field that had been harvested in the Shephelah of Israel here. This entry was posted in Bible Lands, Bible Places, blog, Culture, Egypt, Old Testament, Photography, Travel. Bookmark the permalink. The water buffaloes and cows that we see along the edge of the field in Goshen are “manure machines.” Often there will be 3 or 4 at one spot, eating, and making fertilizer. Ancient farmers and herders may not have like each other, but they needed each other. Semitic shepherds relied on Egypt for safety and security, as we see during Joseph’s life. Fallow egyptian fields provided food for flocks and the animals’ manure was fertilizer for the next season’s crops. Perhaps inundations of the Nile reduced the need for fertilizer, but the Egyptians would have desired wool and food products from the animals. Shepherds were frequently Semitic immigrants – maybe there was a race element behind the Egyptians’ attitude. The Egyptians may have despised shepherds, but they needed to keep them around.